My goal for June was to post something on my blog everyday for this month. Last day of June….the time is going too quickly. 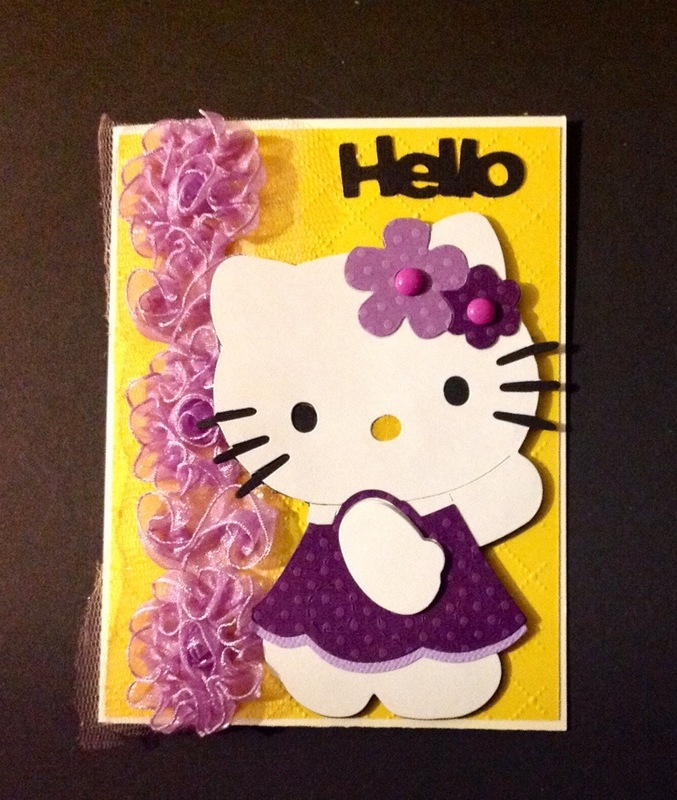 BFF Carol made the Hello Kitty Bees for me to put on composition books. The composition books are on sale at Fisher Hawaii, fifty cents, limit 10. Anyway the Hello Kitty Bees are so cute….thanks Carol. Found the Wink of Stella Clear at J’s today. One for my co-worker Anne. Searching online but always sold out or on back order. Back to working on the composition books. I have a craft fair on Sunday so I gotta finish these. Will post pictures later and details on the fair. 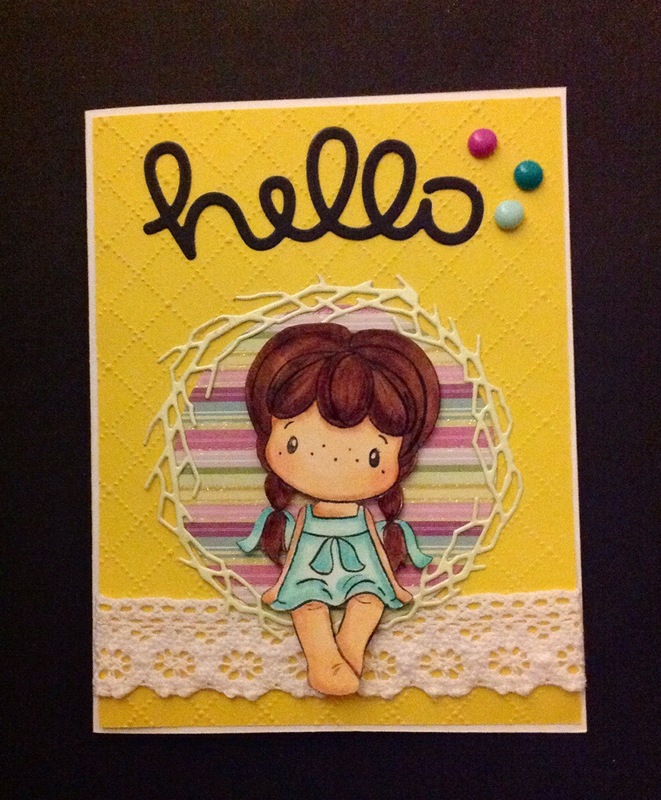 Here are some cute, cute cards Sandy H. made using the new Dandelion Designs stamp sets. 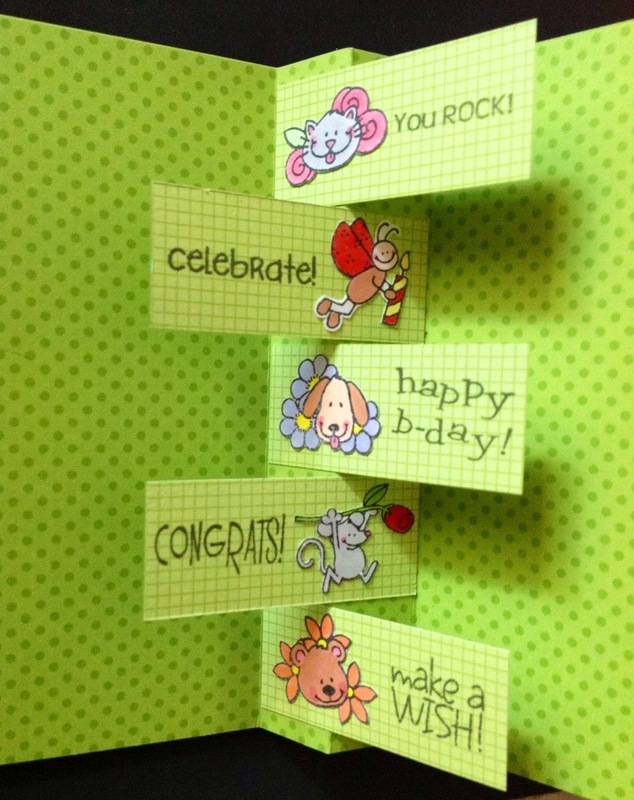 Here is a pop up card. For words, Sandy used the Hero Arts Letter Stamps and punch them out. Can’t wait to get my hands on these stamps. Sandy you always do a great job on your cards. It is a bit early for Christmas but I wanted to use the Memory Box dies in a different way. Here is my card. Used the Memory Box Curling Cloud for the sled. Used the Memory Box Marshmallow Clouds for the snow. I spy white enamel dots. Selling a bag of 10 for a dollar. Contact me. 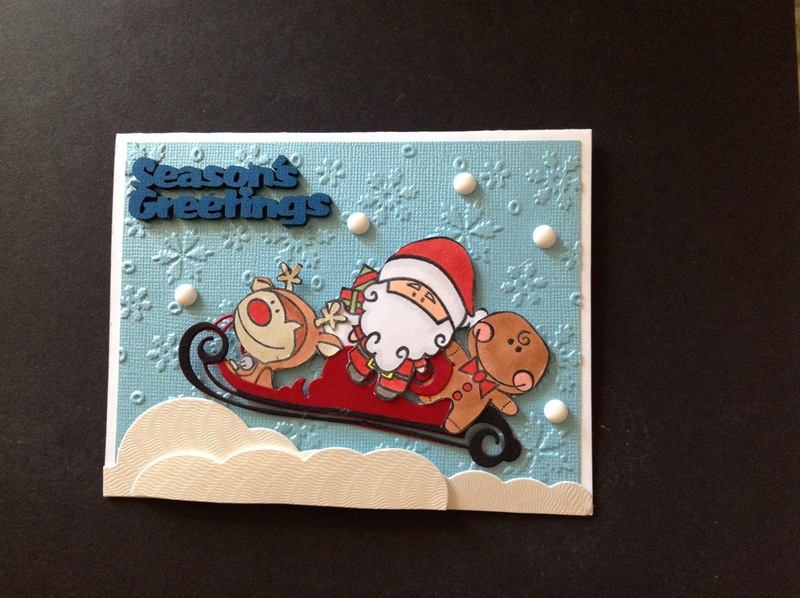 The Christmas images are from CC Designs No Peeking Rubber Stamp set. Season’s Greetings laser cuts are from Island Scrapbooking. While visiting the store in Hilo, Michelle the owner showed me a card made by Debbie. Debbie layered the laser cuts. I decided to try it. I layered 8 on top of each other. The other several of us met for sharing, shopping and lunch. First stop was TAJ Clubhouse in Ward Warehouse. Hi Jackie, haven’t seen her in awhile. Checkout all the card samples, so talented. Jackie was so sweet to give us a tank top. This store has rubber stamps and metal stencils. Make and Take on most Saturdays at 2pm-4pm. This month Gail and Marietta did the project for the Cricut Club. Gail made a stationery holder and Marietta made a waterfall card. Thanks Charleen for the pictures. Thanks ladies for the project. Thank you Charleen for taking the pictures. Decided to play around with the Inka Gold by Viva. I used the Jade Green on the Poppy Stamp die. Start with Ranger’s Craft Mat. Clean up is so easy with this mat. I used my finger to smudge the Inka Gold Jade Green on the Leafy Sprig Border. Instantly see the shimmer. Let dry then use on your project. Drying time was quick. I used a baby wipe to clean the mat. Here is the card. 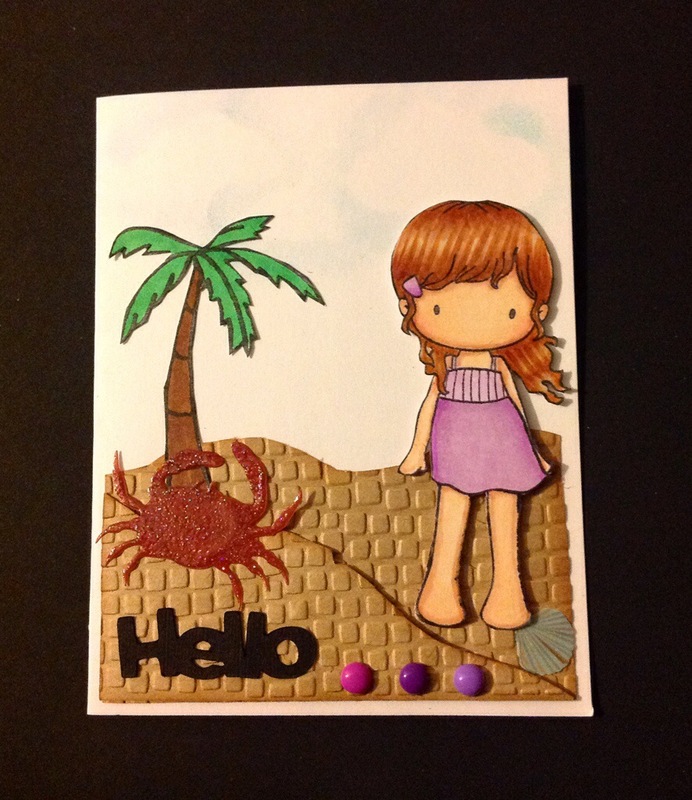 The Laser cut Hello, Poppy Stamp die, hibiscus flowers, Inka Gold and mat all from Island Scrapbooking. Cannot wait to play with the Aquamarine and Gold. 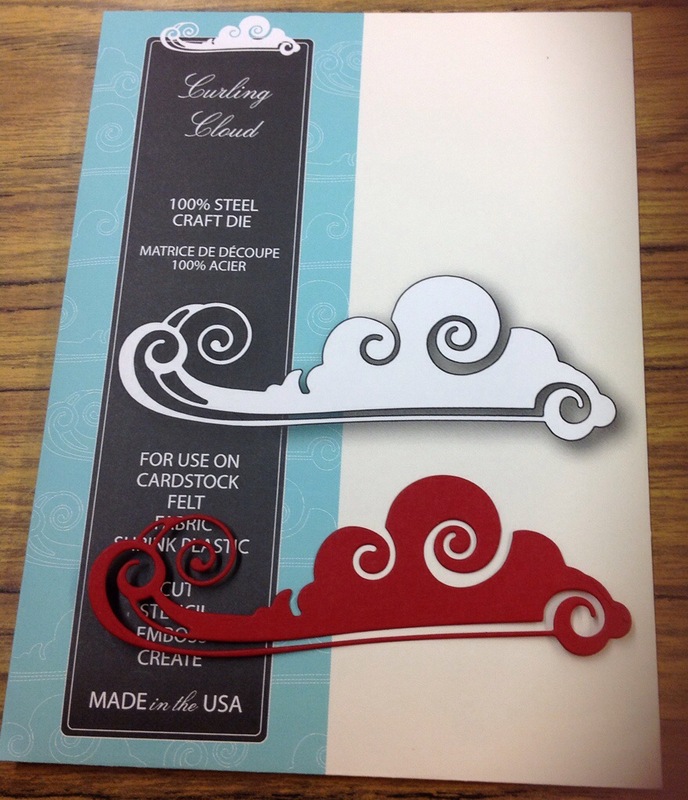 Check out the blog from Island Scrapbooking. Stamp from CC Design Vintage Beach Lucy. Here are some Summer themed Laser Cuts from Island Scrapbooking. Check out the blog from Island Scrapbooking. We were told we had to eat at this place in a bowling alley behind Long’s. We found it on Palani Rd. Was ono!!! We’re in the lounge cruising till departure. Mai Tais on the plane. That’s for coming on the journey with us. The wedding was at Hulihe’e Palace. We got to tour the museum. Had to take off our shoes. Cannot touch anything or take any pictures. The bride was beautiful and the groom looked good, too. Sorry no pictures to share except for the dessert. Variety of desserts but my favorite was the awesome pineapple upside down cake. Fun time. Tomorrow flying home. Saw Memento dew drop ink pads of many color and very, very reasonably priced. Also saw Tim Holtz Distress ink pads in so many colors. Didn’t have my list so only bought one. Saw colors I haven’t seen before. I got to meet Karen from the blog, Have a Scrap Happy Day. I love her blog, check it out. Thank you for the Laser Cuts. Also visited Ben Franklin in Hilo the other day. Remember no plastic bags. Ben Franklin I got a nice paper bag. Ross charged 10 cents for a bag. Target we bought a recycle bag for 79 cents. Island Scrapbooking had so much Memory Box dies and stencils. Even had the new ones that I already ordered from somewhere else. Michelle, the owner just got in the Prima dies. Very reasonably priced so I had to get them all. Can’t wait to use them. Michelle showed me how to use the Inka Gold paste. So I bought green for leaves, blue for the sky and ocean and gold. I bought memory box dies and poppy stamp dies. Bought the Die-namics dies. The circle and ovals have the tiny holes on them. The other die is the months of the year. I can use this for school. Here are just some of the Laser Cuts I bought. Forgot we had to exit the plane and walk down the stairs. Get off the plane and you hear singing and see hula dancing. DH Joe drove 80+ miles from Kona to Hilo on the Saddle Road. First stop is Island Scrapbooking. Met the owner Michelle. Such a sweetie! Thanks for all the freebies. Tomorrow I’ll show you what I bought. Made this simple wedding card. Used the Memory Box Love Script and Prim Poppy from All Natural Accents. 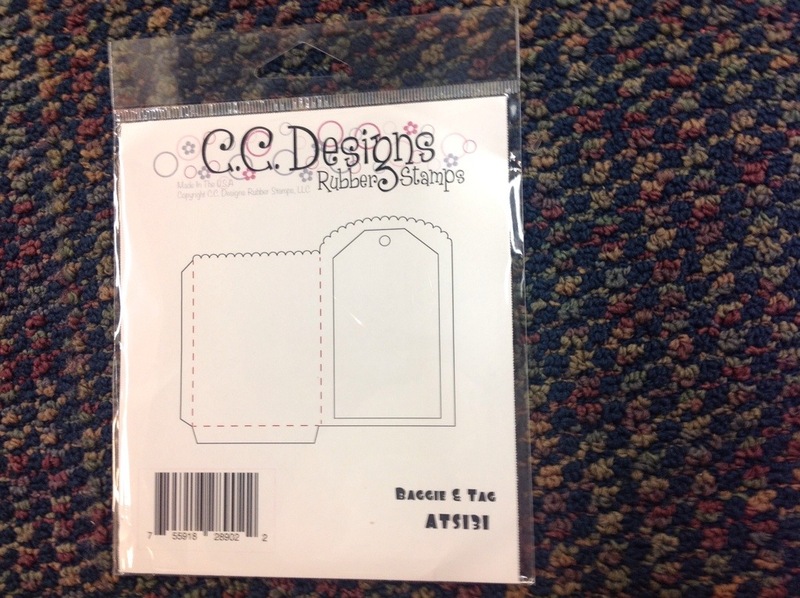 Scalloped die by Lawn Fawn. Will be visiting Island Scrapbooking tomorrow. Another Fourth of July card. Using Felt Sticker Stars I bought ages ago at Michaels. The felt sticker is a long piece, looks like you could make three cards. 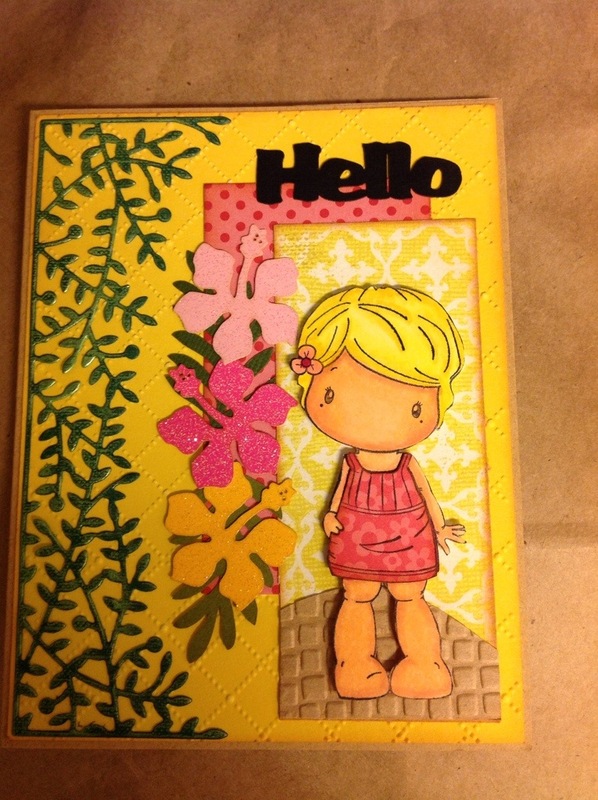 Used the CC Designs Hello Birgitta stamp. I spy enamel dots: medium and dark blue. Colored CC Designs Hawaiian Birgitta and used the Memory Box Kensington Border die found at All Natural Accents. Laser cuts by Island Scrapbooking. I will be visiting your store this week. Three enamel dots: Baby Pink, Medium Pink and Dark Pink. I was inspired by June’s ATC swap. I punched out a few stars then used distress inks Fired Brick and Faded Jeans. The stars was used as a stencil. Added the enamel dots onto the stars: red, white and dark blue. Selling the enamel dots in packs of 10 in a bag of one color for a dollar. Paper from Doodlebug Stars & Stripes 6X6 paper pad. Changed the picture, was too dark. Thanks for stopping by, enjoy your week! I’m selling enamel dots that was made with Perler bead and a toaster oven. I have a Halloween, Christmas and Easter pack. Here is the Halloween pack. One bag is a dollar. In this pack you will get 3 purple, 3 orange and 4 black dots. Look what came in the mail . These stamps were two released in May. These stamps were released in June. Cute bear and sentiment to match. My co-worker Anne made this birthday card for me. She used my favorite color…red. She used a stamp from Yumi & Fumi. She colored and paper pieced the girl. Anne wanted to see how many embellishments she could use. Thanks Anne for a fabulous card. Gathered with friends the other day. 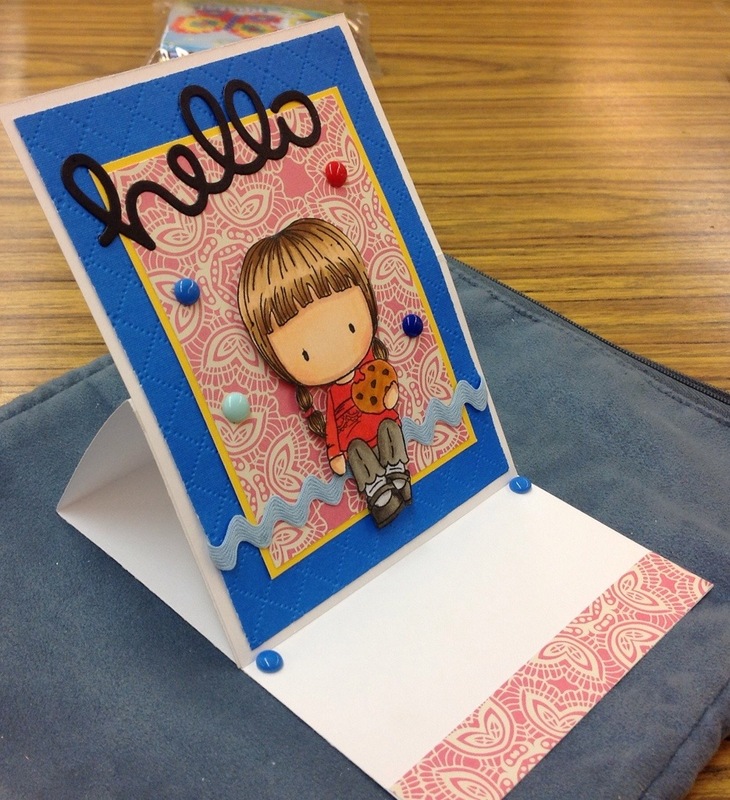 The Make and Take was this Pop Up card created by Sandy. Laser cut from Island Scrapbooking. I spy a handmade Enamel dot…. The image is School Lucy from CC Designs but she had a haircut. Love her short hair, so perfect for summer. School Lucy was colored and cut out for us…..thank you Sandy! The flowers were heat embossed and we had to cut them out. I spy more enamel dots…. Delicious cranberry muffins, Greek lunch, shopping, sharing ideas, and spending times with friends. Let me show you what I bought. 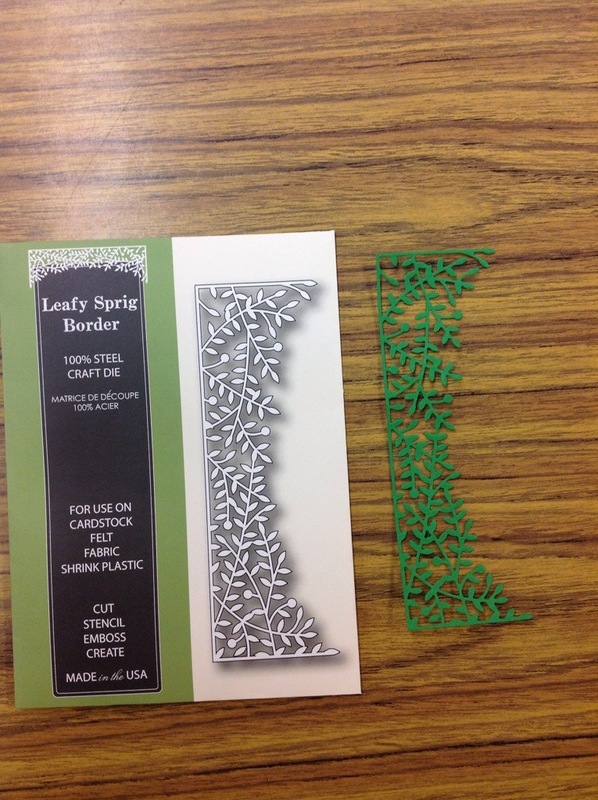 Two dies from Lawn Fawn: Grassy Border and Stitched Scalloped Border. Items were bought from Lianne. If you are interested in her products, leave a comment below. Thank you Sandy for the Make and Take project. Sandy made this gorgeous birthday card for me. She used a CC Design image. I like the Memory Box die, gotta get this one. Inside the card is so fancy. She colored and cut out all the stamped images. Thank you Sandy for a beautiful birthday card. Summer Swing Birgitta is from CC Designs stamp. Used Memory Box Grapevine Wreath. Here are the four cards Mako and her friends made today. 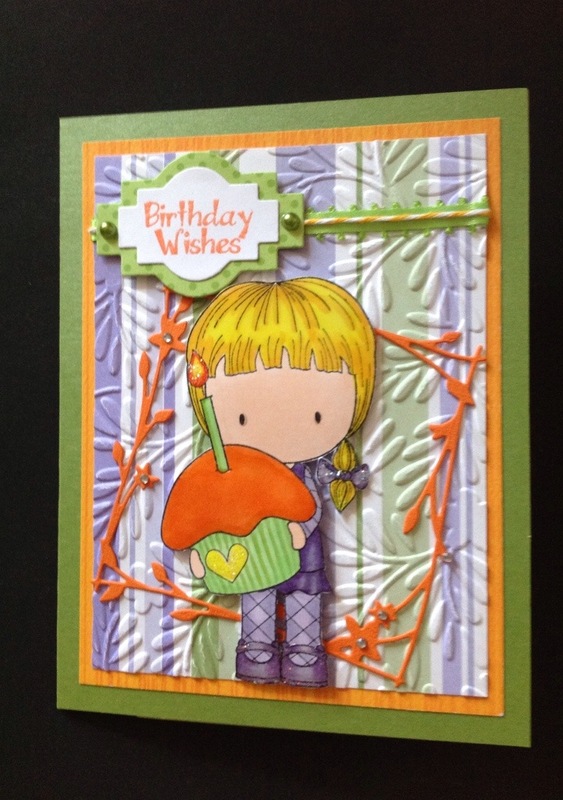 Used the CC Design Happy Birthday Meoples stamp set. Each card has the origami fold, I saw on You Tube Dawn5377. Monstera Leaves found on All Natural Accents. Haven’t made a Hello Kitty in ages. Forgot how long it takes to put one together. 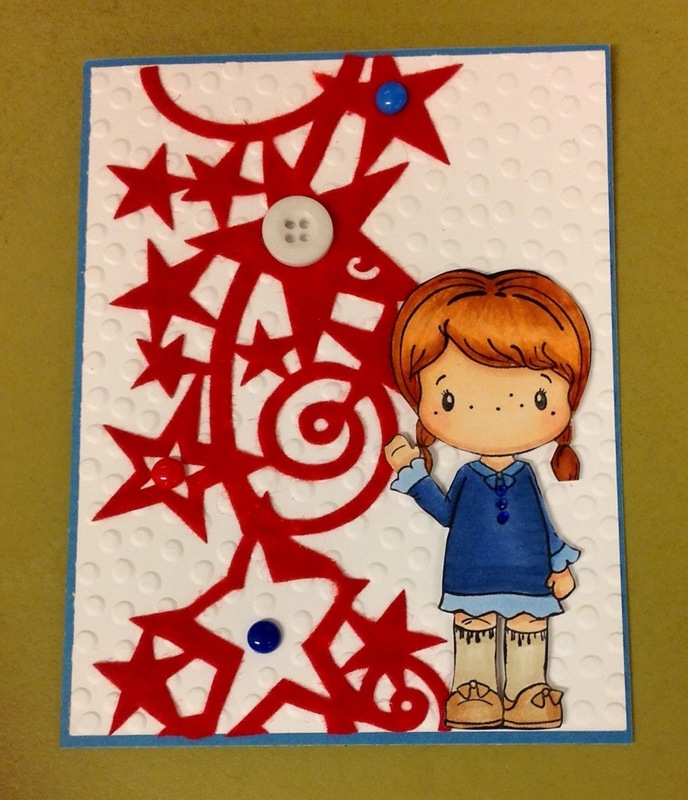 Here is Emma from CC Designs Stamp. Matching purple family enamel dots, made from Perler beads. Sentiment was from Cricut cartridge…..I cannot remember which one. On the sky, I used the Memory Box clouds with Tumbled Glass Distress Ink. Used Cookie Emma from CC Designs Stamps. Here are pictures of the easel card. My cousin Dawn’s birthday is today. I made her a card. 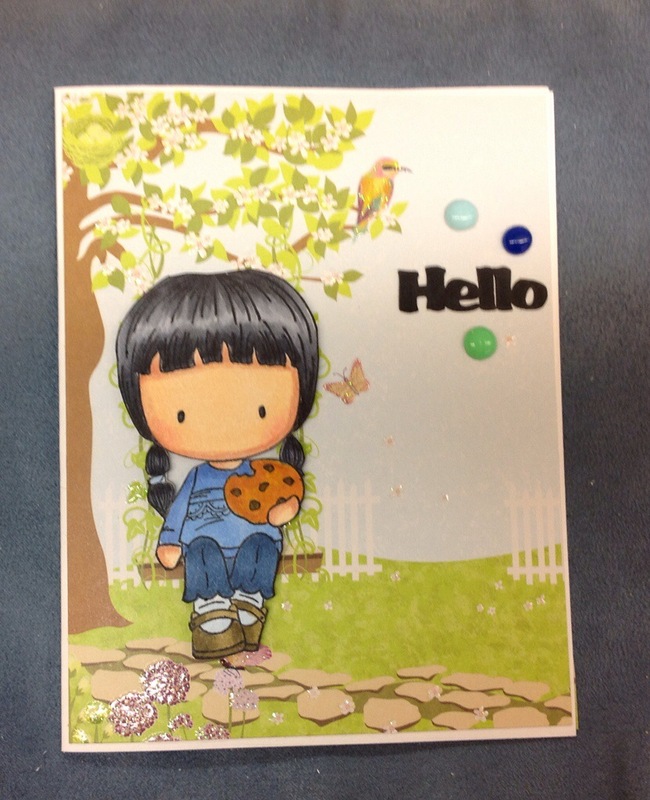 Used The Greeting Farm Double Cupcake Anya stamp. Thanks Jasmine for working your magic and getting the stamp for me. Do you see the handmade enamel dots made by my co-worker Anne? Small Monstera Leaves found on All Natural Accents. Laser cut by Island Scrapbooking. Used Hawaiian Birgitta from CC Designs. 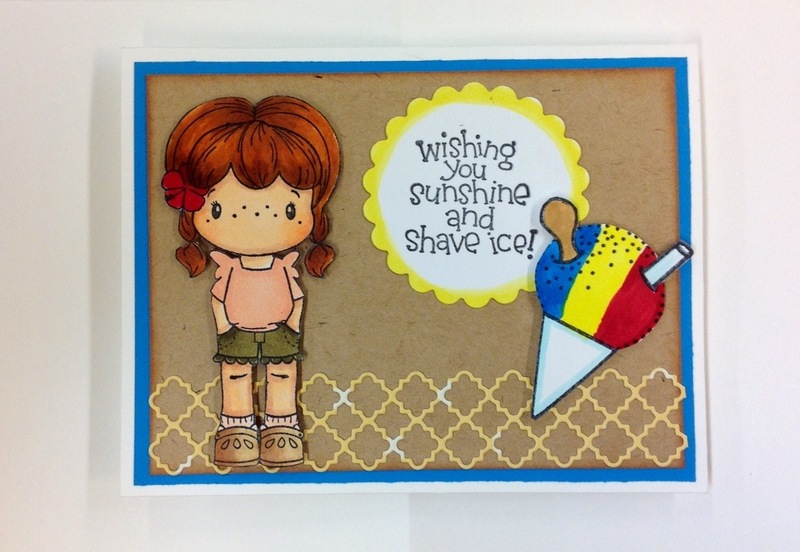 Shave Ice and sentiment from Dandelion Designs stamps. Tessatina Border from Memory Box found at All Natural Accents. Found paper from my stash. 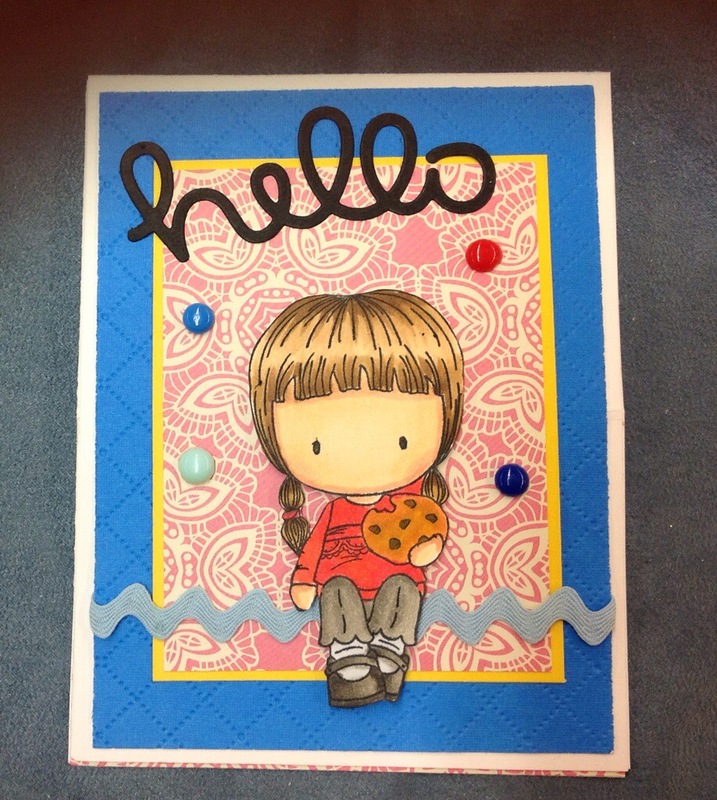 All I added was Cookie Emma from CC Designs, handmade Enamel dots, and laser cut from Island Scrapbooking. Used the handmade enamel dots using the Perler beads. The first batch we had a problem. The enamel dot was sticking to the parchment paper. My co-worker Anne bought this parchment paper from Whole Foods. Now the dots do not stick or you just pick them off easily.